Hi, friends. Today I am sharing my first post with my brand spanking new bar cart! I have had it in my home office for a few weeks now and have been stacking organizing folders on it and thought! Enough! It is time to make it pretty. What better holiday to christen my beautiful new cart than Easter! 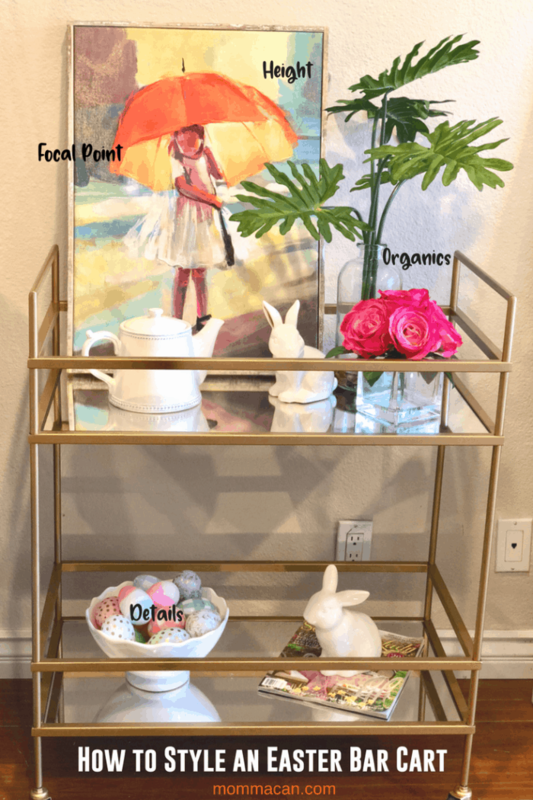 Today I am sharing How To Style and Easter Bar Cart! I love bar carts! They are transitional pieces that can be used for entertaining, organizing, and used for artful displays as I am doing. Bar carts come in many shapes and sizes; I have three currently. I love all of them! Now on to the styling! This design is based on creating a bar cart using it as an artful display. 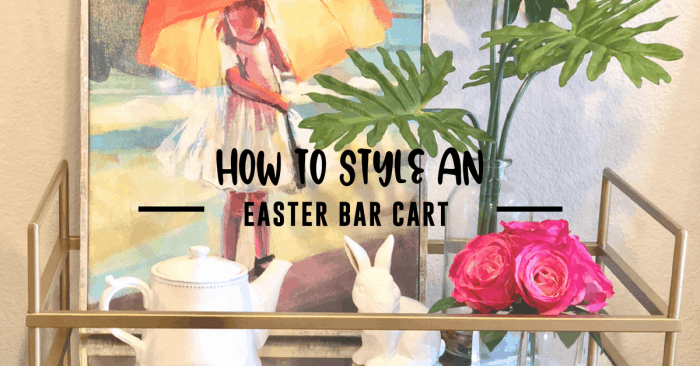 – How to style and Easter bar cart. Organics – Using green stems, foliage, flowers, and yes even a bowl of fruit would work. This gives your styled cart a living element. Details- The bunny, teapot, and the bowl full of Easter eggs give the styled bar cart its theme. Focal Point – The acrylic with the little girl holding the umbrella is my cart’s focal point. The painting is colorful, and I used the colors in her umbrella for inspiration. Height- Giving height to the bar cart using the green foliage stems and the acrylic painting gives added interest. Usually, it is just a vase, but the tall painting makes the cart-styling fun! The magazine reminds me that I can still style an artful bar cart and make it useful. I placed my favorite magazine of the month under the bunny so I could read it at my leisure. 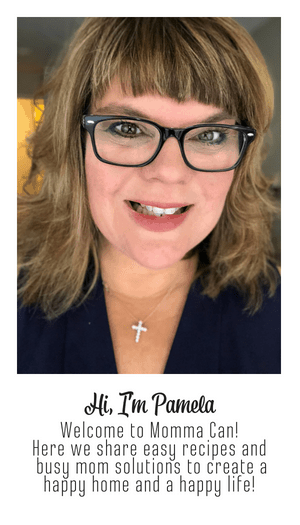 Bar Cart – I purchased mine at TJ Maxx but this one is very similar. It has an X on the sides, which is a detail I would have loved. If you like this post you may love our Spring Table Design Tutorial. Find it here!